The site was established in 1903 as a Roadhouse & trading post on the mail trail from Fairbanks & Nenana to Nome. Tolovana was the first transfer point in the lifesaving "Serum Run to Nome" in 1925. A relay of dog teams carried diphtheria antitoxin to halt the deadly diphtheria epidemic for the 675 miles in temperatures of -60 F and colder. We highly recommend the book "The Cruelest Miles" by Gay Salisbury and Laney Salisbury. An excellent telling of this incredible achievement. 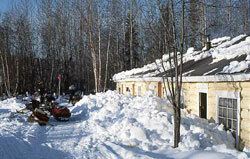 Tolovana Roadhouse is the last remaining Roadhouse of that time on the Nenana-Nome mail trail. It was listed on the National Register of Historic Places in 1989 after extensive restoration.